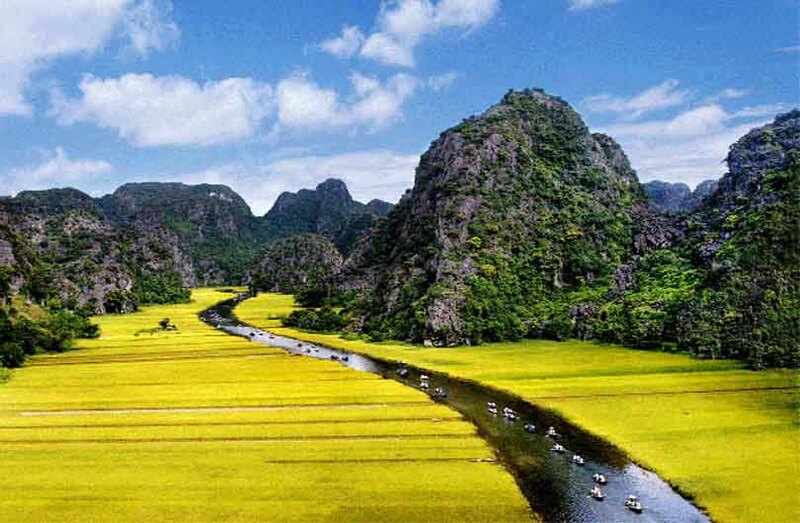 Off the beaten track from bustling Hanoi, you travel to the Northwest of Vietnam to experience local minority life with terrace fields, Vietnamese local flower fields as vast area. Trekking across local villages to enjoy daily life and wonderful landscape en route. 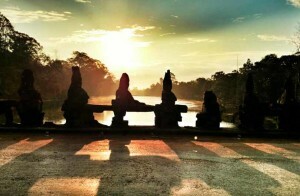 At 07:30 am departure from your hotel to Hua Tat. Arrival to Hua Tat after 5 hours, you will enjoy the lunch with local foods. After that you start a beautiful and leisurely mountainside ride along the old colonial road 6. It is a 25-kilometer ride to Moc Chau town, and the journey is at your own pace, usually taking about 3 hours. 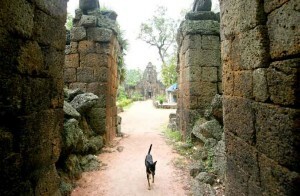 You arrive to a large and beautiful Thai village lying at the bottom of a limestone mountain. Time for a shower and some rest before dinner. Overnight in the stilt house of our gracious hosts. Breakfast. Transfer back to Mai Chau to visit one of the most interesting market in the region, Pa Co Market. The market is a small one that runs every Sunday in Pa Co village where local people, mostly H’Mong coming from the surrounding neighborhood to trade. The market starts early in the morning and finishes a couple of hours before noon. Then take a relaxing walk in the neighboring villages of Xa Linh. This short trip is worth every minute of your time from the great drive to the interaction with the local people of different tribes. Then depart to Mai Hich. Mai Hich is a small village located in the South West of Mai Chau district. Walk through corn fields and rice fields, you can observe or even take part in daily cultivation activities of local people so as to discover the simple beauty of Thai culture. 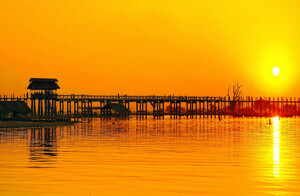 In addition, traveling along the Xia stream by bamboo ferry will bring more excitement! 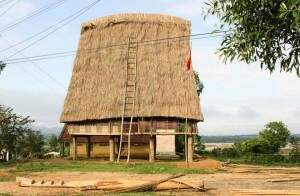 After lunch in Mai Hich homestay, you leave our hosts and drive East for about 15 kilometers to Pu Luong Reserve. Overnight in special accommodation (Pu Luong Retreat). Breakfast. You will be transfered to a suspension bridge over the Cham River, where you begin your walk in search of stunning water wheels. Get up close to each wheel and discover how water is moved from river to handmade bamboo aqueducts via simple constructions of all sizes. Trek through small paths shrouded in vegetation to slowly reveal a picturesque village sitting at the base of a towering mountain. Your camera will not be able to sit still! Back to the retreat for lunch and relaxing. Leave the Retreat for Ninh Binh. On the way, stop to visit to the Citadel of the Ho Dynasty, recognized as a World Cultural Heritage by the UNESCO, situated at Vinh Loc district, Thanh Hoa province. 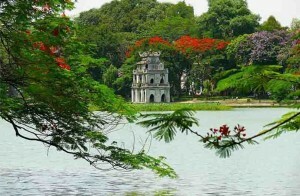 It was the capital of Vietnam from 1398 to 1407. The citadel of the Ho Dynasty is considered as the only stone citadel remaining in Southeast Asia and is one of the few remaining in the world. Then continue to Ninh Binh, passing through the beautiful landscape with immense pineapple plantations. Arrive in Ninh Binh at about 6PM. Dinner by your own. Overnight at hotel. 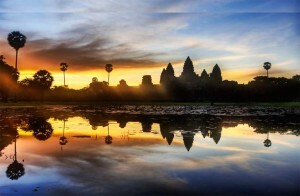 After breakfast, you will enjoy an easy biking tour (about 2.5 km) through rural villages, limestone rocks and impressive rice towards Thung Nham. You will have the opportunity to admire a magnificent panorama view of the region that is considered the Halong Bay on land. A rowboat ride on a small river through 3 caves that give you the impression of being in a magical space. Inside the 3rd cave, there is a large stone resembling an elongated Buddha that brings luck, happiness and prosperity to man. This place is called the cave of Buddha. Then landing for a walk (10 minutes) in the amount up to Thien Ha cave (Celestre River) where you will continue a boat ride inside the cave over 300 meters with beautiful stalactites and stalagmites. Back in the boat at the pier Thung Nham, then back to Tam Coc by bicycle for lunch. In the afternoon, transfer to Hoa Lu, the capital of Vietnam for 41 years under the Dinh and Le dynasties (between 968 and 1009), to discover beautiful shrines dedicated to the Emperor Dinh and Le, the first ruler to unify the country. Aside from this important historical site, this region is also worth a visit for its rolling hills and picturesque rocky landscapes. Transfer back to Hanoi.